A brief look into waldorf dollmaking, supplies needed and tips to get started. I know I told you all, back in January (I know!) that I was going to publish a post with tons of links and then puff. I did nothing. But, in my defence, the dolls are very demanding and I just like to do whatever they say. So, be gentle with me. Here we go!. Let me start my doll making series with trying to define to a degree what a waldorf doll might be, and what it is not. Waldorf dolls are called like this because they were adopted by the Waldorf education system and have now become mainstream in the world of natural toys. Just briefly, Waldorf education speaks about the development of the child as a whole: mind, body and soul. Children under seven years of age are considered to live in a dream-like state, a realm of fantasy, as their souls are growing more and more, anchoring into their physical bodies. As their internal organs are growing and their brains developing, they take impressions from the world that surrounds them: the music, the light, the food they eat, the toys they are surrounded with, the harshness of the world we live in, etc. That is why Waldorf education promotes surrounding your child with natural materials, that speak closely to the soul of the child; with colours that are soothing, not screaming; with less media exposure to allow their young brains and bodies to first process the real world before diving into the virtual one; with music of the heart, instead of the strident noises of high-pitch machines, etc. Providing your child with simple, and few, toys that encourage their imaginative muscles to work, to enliven their toys, to create worlds of their own. Stuffed animals are meant to represent real animals, not caricatures or anthropomorphic characters, but to connect children to the world we live in through truthful representations of their environment. Starting your dollmaking adventure, supplies and tips to get started (via Fig&me). The truthful representation of humans is therefore extremely important. Doll play is believed to enhance nurturing characteristics in children, and help them mimic the way we interact with others, perhaps by reliving painful or hard-to-grasp concepts or events, through their doll play. I wholly believe doll play is cathartic, not just to children but to adults as well. Providing children with a doll that represents themselves I would say is one of the main characteristics of a Waldorf doll. The doll is a mirror image, so to speak, of the child: with same body proportions, a blank expression (to allow imagination to make the doll alive) and made of natural materials that speak closely to the inner world of the child. The doll is meant to be a simple toy, that the child can approach, that is suitable for their developmental stage. If the child is very young, and just starting doll play, a fully dress-able doll might not be appropriate for them. If the child is older, and requires more interaction with their doll, accessories, play food, or even other dolls to play with are therefore required. I would say that the three main characteristics, aside construction, of a Waldorf doll are: a genuine representation of human body proportions, a blank expression, and made of natural materials. Starting your dollmaking adventure, supplies and tips to get started (via Fig and me). The techniques that are most widely associated with waldorf doll making are not Waldorf. 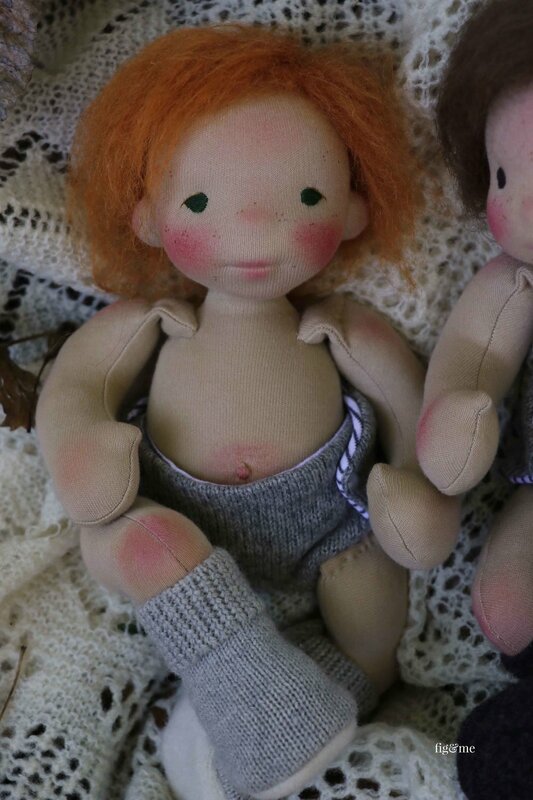 They were prevalent at the time that Waldorf education came around and were appropriated by the many doll makers who started creating dolls based on their education theories. These are techniques for cloth doll making, that had been around for many years before the education movement arose. Rolling strips of wool to create a ball, that then it’s covered with tubular gauze or stockinette, to be sculpted with needle and thread, cquiring its “characteristic”soft shape: an eye line, a nose, round cheeks, and most importantly the shape of a human head. A body pattern that resembles the proportions of a child. Age vary the proportions so here you have to pay attention to the head to body ratio. More or less, the arms reach as long as the hips, with the thumbs positioned at the seam where the legs join to the torso. Feet and hands are proportionate to the overall body, and the head, VERY important, is not too large or too small compared to the body length. I cannot stress enough the importance of the head size. If you are making a baby, then the torso and legs and head are about equal in size. If you are making a child over 1 year old the proportions start to change quite a bit. I mostly use the proportions of my daughter when she was about 5 years old. Look at your children and you will see that their heads do not go over their shoulders, that they are centred. Another way of deciding the proportions is to picture your doll inside a pentagon, with head, hands and feet at each vertex. Therefore, when the doll has her arms stretched out and her legs, all distances from each point are equal. Most waldorf dolls are sewn with European-made fabric, since that is where this educational approach originated. It can either be a cotton interlock (both sides look the same) or a cotton jersey (one side looks knit, the other one has a purl). You could also use wool jersey although it is less common. The cotton interlock most commonly used is made by De Witte Engel (DWE) and the cotton jersey is made by Laib Yala. There is a list of suppliers at the bottom of this post that can help you in sourcing these wonderful materials. This fabric is made specifically for doll making, so it is very sturdy, has low-pill action, and it comes in a variety of shades that resembles skin tones. Please bear in mind that once you stuff the doll, the fabric stretches and lets through the colour of the white wool, therefore all skin tones of fabric will lighten up once stuffed. The stuffing used for this kind of dolls is always wool. I have heard people using bamboo and claiming is a natural product, which in fact is no different than rayon. It is made with a natural resource, but the fabrication of said product is so toxic and so far removed from the initial fibre that it is mostly a rayon-like product. Wool has many properties, and I am not going to elaborate here, but only from a doll making point of view: this stuffing is the BEST. Because it retains its shape, it is easy to tear into small pieces, it has loft, and it can be compressed and you can wound it into an extremely firm head. It can also be felted, and if you want to experiment with needle-felting you need to use wool to achieve the best results. From another perspective, wool retains heat, it is a biodynamic fibre that reacts to its environment and has memory. I could go on and on, but I will spare you. So from these basic tenets, most waldorf-style dolls are made. Now we go deeper. I do not create Waldorf dolls, I stopped doing so a long time ago. At least I thought that initially my dolls were to be presumed in that category because I consciously prescribed to the tenets of Waldorf education, in creating a doll that spoke to the child, and that had no expression, made exclusively with natural materials. But doll making turned into an art form for me, it gave me a fantastic medium to exercise my creativity and I was blessed with the opportunity of expanding my skills and knowledge of doll making by leaving the realm of Waldorf-inspired dolls. I would say my dolls still hold some of the simplicity, at least to an extent, of Waldorf dolls, however they are much more elaborate, they do have expressions, I not always use natural materials for their clothes, and there are definite personalities coming to life in my dolls. While I still try to make my dolls accessible to a child if they were to play with it, I firmly believe the majority of my dolls are more suitable for much older children, or children at heart. So even though the vast majority of the dolls out there are not considered Waldorf dolls, we have to call them one way. 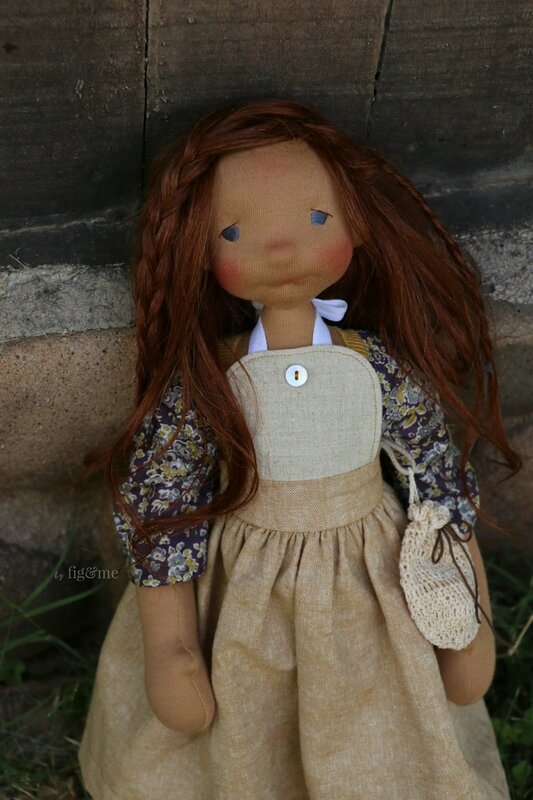 A doll with a simple expression, made of natural materials, with a rolled head, lightly needle sculpted, it is not a Waldorf doll, but it is the closest approximation of a category. Do not get hung up on titles, I lost them a long time ago and I am glad I did. Calling my dolls Waldorf dolls always felt a bit of a constraint, like I wasn’t allowed to grow from there, to experiment, to give more life-like characteristics to my dolls because in the realm of Waldorf education more is not needed. The less you add, the more the child has to put in, which is the aim of the toy: to help them construct their own world. 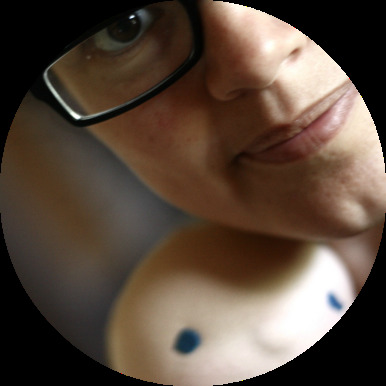 I went from creating a simple doll, sturdy and not too heavy, with very simple clothing that could be easily changed by my then very young children, to dolls with ears, bums, knees, belly buttons, lips and what not. While my dolls are in no way appropriate for a small child, creating them gives me a satisfaction beyond compare. In a way, I am happy to have strayed so far from the realm of Waldorf doll making. You probably just want to get started. So here we go. The best advice I can give you is to buy a pattern from a reputable doll maker. If you are a VERY beginner dollmaker, i.e you have never made a waldorf doll, and you are intimidated by all there is to do, I suggest you start simple and easy. In 2017 I released a Beginner Dollmaking pattern called the Wee Baby Doll. It is a 9" tall doll, made with repurposed cashmere body. You will learn to sculpt a little head (the 'waldorf' way), to embroider a simple face, basic body proportions, and in the end you will accomplish a cute little doll with very little cost in materials and time. Later that year I released a second pattern, called the Little Fig. As you might be able to notice, I am publishing my patterns in order of difficulty, so that you can learn with each and every single one. The Little Fig doll pattern helps you create a 14" tall doll, you can learn to add more facial features with needle sculpting, how to create a wig out of mohair yarn, and how to construct a doll with very pleasing toddler proportions. That pattern comes bundled with a set of clothing to help you save some money, better used in buying the supplies to make it. Now in 2018 I have released the Baby Fig Doll Pattern. This one is a bit more intense, both in construction and sculpting. I am introducing the technique of needle-felting to add more depth to facial features, giving you two ways to make hair, and the pattern comes with instruction to create a diaper, bib and a sweet little headband. So you can partially dress your baby as soon as you are done. Make sure to check around the store as there are two layettes that fit this baby perfectly, and even some bundled patterns for you to save money. I have received wonderful reviews on all my patterns so far and I am deeply grateful to each and every one of you that has decided to spend your time creating dolls with them. I know my patterns are a little bit more pricey than most, but I do believe they are currently among the best out there. Not just in design, on which I spend ridiculous amounts of time, but they are backed by close to ten years of experience making dolls. But, if my patterns are not what you are looking for, I encourage you to look via Etsy for the ones that most appeal to you. I am sure you will find out one that comes close to the vision you have in your head, and get you started in creating a doll and teaching a few new skills. It doesn’t matter if the pattern is nowhere close to your approximation of beauty, as long as the end product looks of extreme high quality, I would recommend to you to start this way. I have never in my life used a waldorf doll making pattern, but it would have come in very handy when I started. I think using a pattern will give you an idea of the body proportions, of the amount of materials you need (instead of trying to figure it all out), and also walk you step by step though the construction of a doll. I really wish I could have some magic, to make myself real tiny and go and peek on you while you make your first doll. I still remember my first one, and my second one, and my third...doll making is one of the most magical things I can think of, and I wish you all the luck in the world embarking on something that can turn your whole world around. I would recommend the next places for your doll making adventures. I will come back again, hopefully it won’t take me too long, and give you some advice in case you have already made a few dolls and would like a few pointers. But to get started, this is the best compendium I can give you at the moment. I am so very proud to call her my dear friend, maker of dolls extraordinaire and puppeteer, you can find her both with a needle in hand or a spade digging in her beautiful vegetable garden. She keeps teaching doll making but most importantly tutors new and established doll makers on how to overcome certain technique or pattern problems, plus giving you handy tricks and helping you discover your own style. 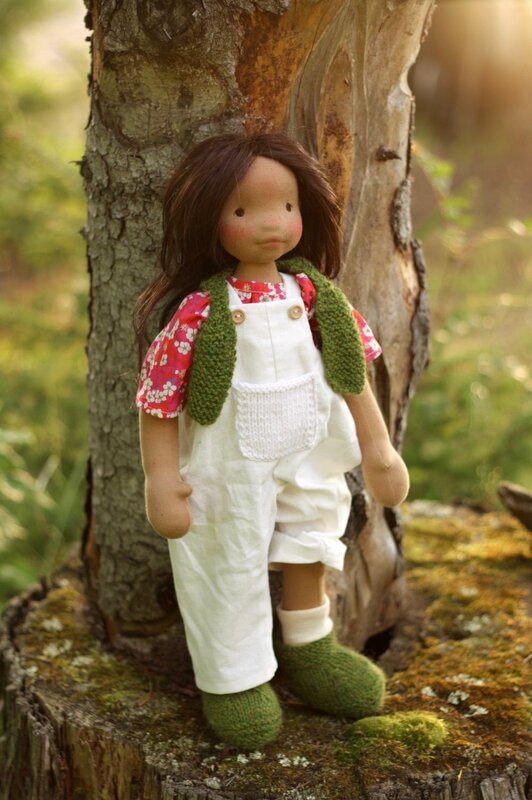 She has also published a pattern for creating a little doll called Kiki in the Meadow, you might want to start there. Jenny has been working in waldorf doll making for over ten years and has hosted many little workshops in her cozy home. She offers regular workshops through out the year, so if you happen to live in the southern hemisphere and can hop on a plane to visit her on her magical little island, then you won't be sorry. Jenny has a world of experience and a knack for making the complicated, easy. 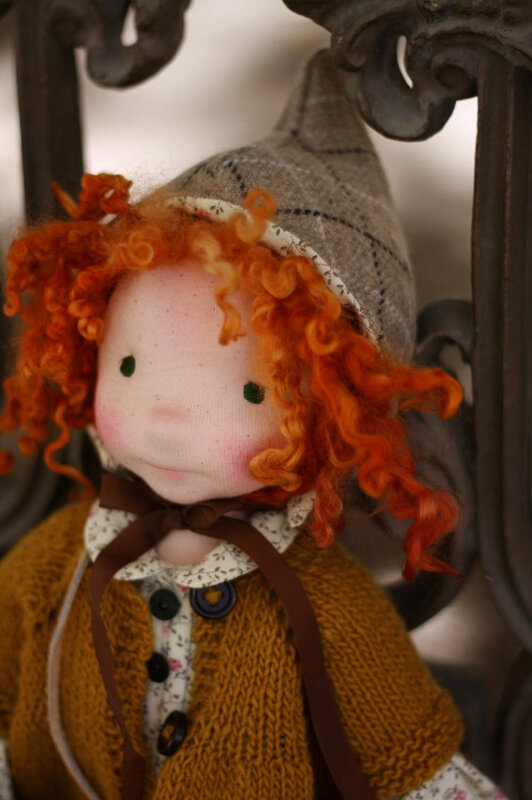 Anouk is such a caring and talented dollmaker, specializing in very well constructed classic waldorf dolls. She has been teaching dollmaking for many years and hosts regular workshops. If you can learn from Anouk, I highly recommend her. Everything she does is of the utmost quality and has a very tender approach to her craft. I think my friend Agnes is one of the most prolific teachers I know. She hosts waldorf doll making classes all the time, as well as more detailed sculpting wool classes. The teaching is done in polish I believe, but Agnes speaks very good english so I am sure you can work something out with her. I am now teaching doll making workshops all over the world. So please take a look at my current workshop schedule and contact me if you think you can make it to one of those locations. I am so excited to finally be able to impart some of what I have learned over these years, and help you discover doll making while I hold your hand. Remember you will need quite a few things to get started: a basic sewing machine, matching sewing thread, scissors, marking utensils, etc. 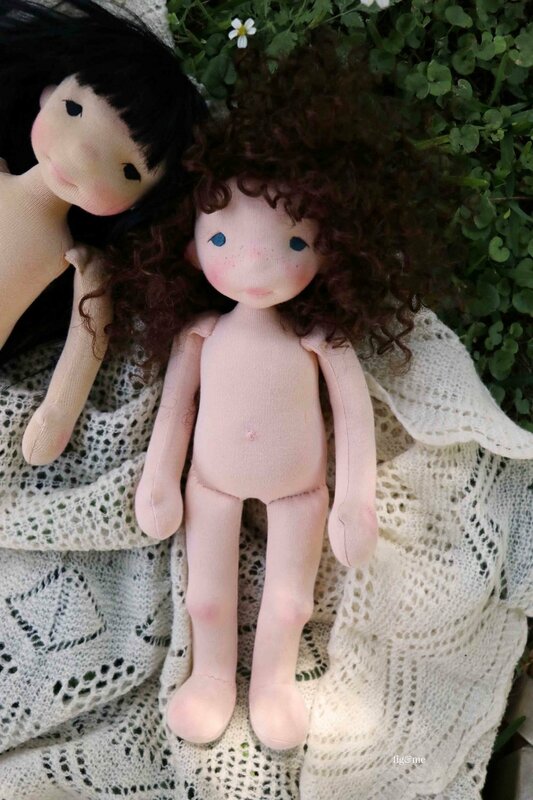 Plus the more specific doll making needs: doll skin fabric, wool batting, the inner cloth to hold the wool and sculpt the doll's head called 'stockinette', long doll making needles, embroidery thread, etc. Little Oke Dolls (UK) Debby is a wonderful person, and very easy to work with. She is also one of the doll makers behind a special line of a wonderful brushable mohair yarn for your doll. Kamrin's Poppenatelier (Netherlands) Kamrin is the other doll maker behind the mohair doll yarn adventure. She sells all sorts of supplies, patterns, etc. and is now organizing a wonderful seminar every other year in The Netherlands. Woll Knoll (Germany) This is where I buy my swiss jersey (Laib Yala brand) for the larger dolls. I like this jersey because it is very sturdy and the fabric seems to drape much nicer than the interlock. The Olive Sparrow (Canada) Monika is a close friend, she sells high-end needle-felting supplies, but if you live near Toronto she can supply you with Laib Yala fabric and wonderful wool stuffing as well as booking a dollmaking class with her. Monika is a true artist and her work in wet-felting boggles the mind. Bear Dance Crafts (Canada) Natalie is a wonderful person and extremely funny!. She sells all sorts of doll making supplies, I buy my cotton interlock from her. She also has many patterns and kits if you are looking to create small figures for your nature table or for a special birthday present. She sells her own patterns on her Etsy store. De Witte Engel (Netherlands) This is a heaven for the fibre artist. Beautiful wool felt, all shades of cotton interlock. If you want to make toys, this is a wonderful place to buy from. Reggie’s Dolls (USA) Reggie is a kind hearted soul, who started creating doll clothes, then got bit by the doll making bug and has just started retailing doll making supplies. If you are not up to the challenge of making the doll clothes for your doll, I am sure with some measurements she might be able to make something wonderful for you. I have selected this book, because it comes from a modern perspective and it is aimed at novices. The doll pattern in it comes with a few clothing designs, and I consider it a good way to start you off. It also contains my papoose design in it, so if you wanted to create a backpack to carry the doll, the book would come in handy in that regard as well. I am aware that there are dozens of doll making books out there, but I think this would be a good beginning for you. If doll making does turn into your obsession than you can peruse the many others at your leisure. On doll hair. If you have already started on your doll and would like to peruse the different hair style options available to the curious dollmaker, please visit this post where I discuss many different styles and techniques. If you are looking to figure out doll clothing for your waldorf-inspired or natural fiber art doll, I have also published a handy list of doll seamstresses, pattern designers and even free tutorials. I wish you the best of luck and I am ever so excited that so many of you have started making dolls because my dolls have inspired you, or that write me interested in making a doll for your little ones. I can honestly tell you doll making is not just a wonderful hobby, but it can also provide with so many creative opportunities while giving your loved ones thoughtful toys to play with, and maybe even become your profession one day. It is just what happened to me. For now, I hope this can get you started. If you have questions, feel free to write them here on this post, so that I can reply to you properly. Apr 2 For little hands. Mar 30 The Girl with the Funny Hat.